Changing our outlook on situations and circumstances is a way to grow. It is not always easy to change what we are pre-destined to think nor is it always possible to change our attitudes, but with a little education, a few scientific insights, and measured effectiveness, we can change the stigma of some discrimination that plagues our world of thought. Simple small steps increase the likelihood to understand and grow as a person and as we evolve day-by-day growth is a requirement, think of it as a rite of passage or a stage of maturity. With growth comes acceptance and through acceptance, we can begin to make changes. Are you ready to lavishly live life out loud and Mind Our Future? Maturity comes with age, and age brings on perceptions that we have brought along with us for the ride in life, but what if you could change a perception through what has been scientifically proven? Mental illness is so often tagged with a shameful stigma it is time to make a change and the power of change is you your hands to #MindOurFuture. It’s time to Bring Change 2 Mind and this is how you can help, let’s get those hands, smartphones, and apps ready because it is your turn to #MindOurFuture. Millennials and GenZs, let’s rise to the occasion and be forever remembered for ending the stigma of mental illness once and for all. 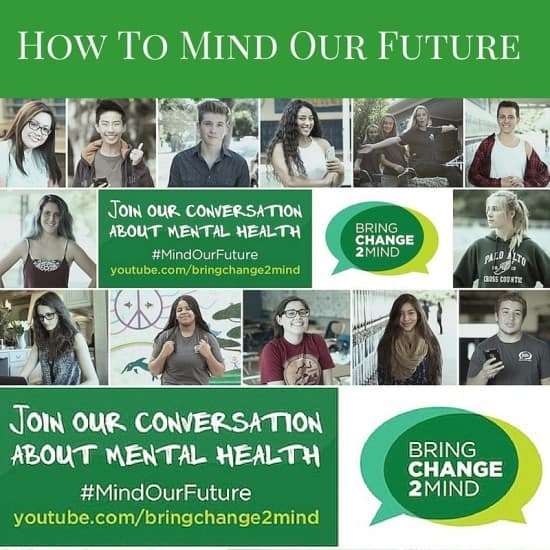 Share your story about lending help or reaching out for help during a mental health struggle by recording and uploading a video to YouTube tagged with #MindOurFuture. Realize that each story shared opens the door for yet another story to come forth because you were brave! Here’s how you can help change the stigma of mental illness. There are widely distributed Public Education Materials based on the latest scientific insights and measured for effectiveness for mental illness. Come together, and talk about mental illness and share in the broad coalition of organizations that provide service, screening, information, support and treatment of mental illness. Together we can make large steps through taking baby ones, simple videos, simple use of social media and outreach to others. Education is powerful and education is the ally of maturity and making a change in negative stigmas. Won’t you lend a hand and change the outlook on mental illness? Grab your smartphones and let’s roll that footage, lavishly living change out loud and make a change to and starting minding our future. I’m too late for the submission of entries. hehe. But I agree, this is a good campaign to raise. I never even heard about this before. I wish for the success of this campaign. This is a great campaign. Educating the public about mental illness will make them/us understand instead of being judgmental. Thanks for sharing. Social media is a perfect tool to raise more awareness and make difference to everyone. Thanks for sharing this information. Really meaningful campaign that they have. Good to use social media for the good of mental health. Having a conversation about mental healthy is so so so important in today’s age. Thank you for bringing this awesome campaign more attention. This is great campaign I hope this raises a lot of awareness. There’s no better way to take advantage of social media other than this. It’s so nice to be part of a program that promotes kindness and compassion. Thanks for sharing this information. This is definitely a great way to make a difference. I love the idea of using social media platforms to encourage others to make a change too. Mental illness awareness and support is a powerful tool for change and acceptance in our society. Thanks for your efforts! It is so nice of you to support this movement, I agree that educating and informing people about mental health will make a difference. I love this campaign!! This is such an important topic and the stigma o it is awful, I had not heard of this app before! As someone who suffers from agoraphobia and has mental illness running like wildfire through the family (everything from alcoholism, autism, depression, schizophrenia, anxiety…), I thank you for trying to make a difference.